Just click here, then on the date/event on the calendar and be sure the description is for the event you want. Then click on "Register Now" and complete form. The Innovative Curriculum Resources Project provides PD and curriculum for CTE teachers across the state. Many of our PD opportunities are beneficial to all educators. Be sure to take a look. I am also available to speak with your administrators about the offerings of our project. ​ Harvey Alston's unforgettable words of individual responsibility for achievement have improved spirits, spurred growth, and changed lives. His powerful, soul-searching presentations uplift audiences to a higher standard, and to a level where they strive only for the best. Harvey Alston believes in solitary achievement, shared accomplishment, and the dignity of human beings. As one of the most in-demand speakers in America, Harvey Alston's career has spanned positions from head football coach of Columbus East High School in Ohio in 1968 to assistant director of student financial aid at the university level. As an educator, he’s taught English, biology, health, life sciences, and math curricula. Come experience Harvey's 'high octane energy' as we discuss student engagement on June 11, 2019, at the Regency Center in O'Fallon, Illinois. The LTC Monthly Webinar Series is a collection of FREE webinars featuring a variety of technology topics. Each month, learn from state and national experts on innovative classroom practices, educational apps/tools, networking and infrastructure, data security, accessibility, and more. Connect and share in real-time with educators from around the state or visit our library of archived webinars to get your professional development on demand. Click on the link below for more details! Dates: Most Tuesdays throughout the school year. 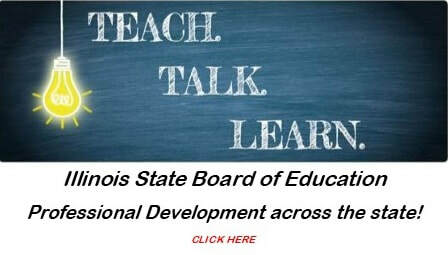 TeachIllinois is a brand new, 100% online, center for educator professional development. Educators can either self-register, or districts can bulk register their staffs. Upon completion of the material, learners will complete the ISBE Seminar Evaluation Form, after which, the official ISBE Evidence of Completion form will be made available. All e-learning courses are currently free, although in the near future TeachIllinois will start charging a nominal, per-PD-hour fee. New content is added every month, and we welcome suggestions for future courses. Our e-learning platform is robust enough that a PD provider (such as a District) could subscribe and create their own ‘channel’. The TRAIL’s cost effective model of bringing these speakers in for a series of presentations located in the north, central and southern regions of Illinois allows educators from urban, suburban, and rural areas to be inspired and motivated to further their professional growth and improve classroom instruction for all students.